Generation Connect is a program that promotes intergenerational relationships between youth and elders through oral history – listening to memories, stories and the sharing of life experiences. Through a unique partnership between A.G. Rhodes Health & Rehab, a nonprofit nursing home provider, and Pebble Tossers Inc., a nonprofit youth service organization and family volunteering resource, selected teen volunteers are paired one-on-one with elders at A.G. Rhodes to gather and record oral histories. To build and strengthen connections between people, to teach the value of listening, and to establish an invaluable archive to better serve the staff, elders and families at A.G. Rhodes. The information collected will be used to tailor meaningful activities and provide more personalized elder care. Teens 15-18 years old may apply, and if selected, must attend an education session. Following the training, participants will be paired with up to two elders and will spend at least one hour a week for eight weeks meeting with them. These meetings can be scheduled on a flexible basis and can be any combination of one-on-one visits, social events or the elder’s favorite activities. The application, including a 250-word essay, will be available in the Spring. Teens who are 18 years old must also complete and pass a criminal background check. 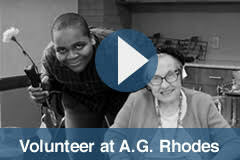 Contact Kim Beasley, Director of Volunteer Services & Community Engagement, at volunteer@agrhodes.org or 404-245-4111.